When Life Asks You Questions…. As human beings we are full of wonder and curiosity. We ask questions, life asks questions of us, and there really is an art to asking the right ones. 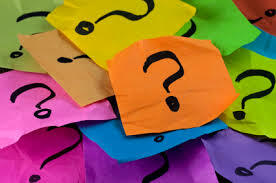 How can we find the answers if we don’t know which questions to ask? Life asks you questions every day in answer to your questions and although this leads to more questions, those questions will point you in the direction of the “right” questions and eventually the answers. If there are answers you’ve been seeking that don’t seem to come you are asking the wrong question. It is also possible the answers might be right in front of you in the form of more questions. More questions may indeed BE the answer! There really aren’t “wrong” questions but if you’ve been looking for an answer and you keep asking the SAME question, try changing it up by asking a different question. That said, life asks you questions and if you’re running about looking for an answer to the wrong question you are not paying attention to what your life is asking. It may be that life is answering your question by asking you to explore your inner sanctum. Ask what (or whom) you need to let go of to move forward. Ask for help releasing the limits placed upon you. Ask to be shown the truth. You can also, and this is profound, ask for guidance to direct you to the real question. What if it’s NOT about finding THE answer but being guided toward growth and expansion as a way of answering life’s questions? What if you are being pointed in a new direction? What if there are great insights within the questions? What if the answers lie not in finding an actual answer but leading you to more detailed and direct questions? Previous Post New Moon + Eclipse: Come on Baby Light My Ring of Fire! Next Post Do You Really Want to “Settle” for Good Enough?